Stainless Steel is a very important discovery in the history of mankind. It does not corrode or stain as easily as ordinary steel. This is the reason why so many of our tools and equipment nowadays are made up of stainless steel. It�s resistance to corrosion and staining make it ideal for many applications. 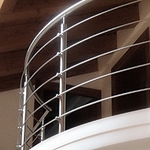 In architecture, stainless steel is used for aesthetic and practical purposes. Since this kind of steel is resistant to corrosion, rust and staining, structures made up of stainless steel and stainless cable retain their original appearance and last longer than ordinary steel. Staircases at home are no exception. 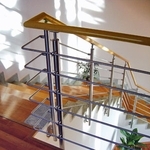 Beauty and durability are combined in this one of a kind stainless steel staircase that offers safety, resilience and visual appeal that never fails to amaze onlookers. 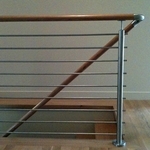 StairWarehouse has stainless stair parts available in both 304 and 316 grade stainless steel. 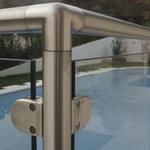 We recommend using 316 grade stainless for all outdoor applications. For interior applications, you can use either 304 or 316 grade stainless. So if you are envisioning now the design of your dream home, take into account how useful, practical and beautiful it will be to incorporate stainless steel in your future abode. If you need help making a parts list, StairWarehouse is here to help. Simply call us at 1-800-591-7224 for assistance with your order.